Yesterday my mother came over to visit after taking my son, her grandson out to run errands. As you may already know she is a seamstress. She's been sewing since she was a child, she told me long ago she use to watch her grandmother sew and that she taught her. As a child I also would watch her sew her clothes to wear out on the town. I remember all the times she made me outfits for school events. Back in the 90's where the popular girls wore Mc Hammer pants , I wanted some so we went out to buy some material and she made me those hammer pants lol!. I got so many compliments and everyone thought the pants were store bought. Another event was a football game, which I designed this short, color pattern dress with long, ruffled sleeves. That dress looked so hot on me and my shape back then was banging lol! They use to call me Coca Cola because I had the curvy figure of the bottle. 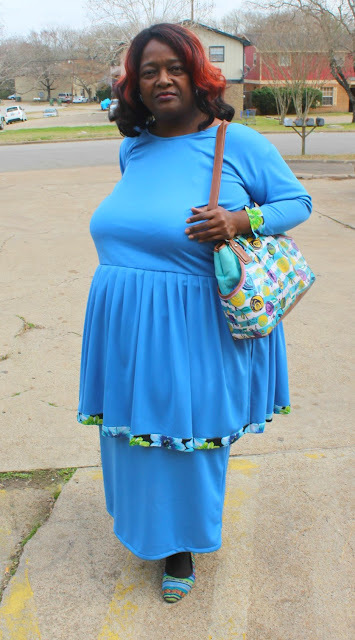 Anyway my mother had on a cute baby Blue dress and she looked so cute. What's The Purpose Of Moms' Dress? 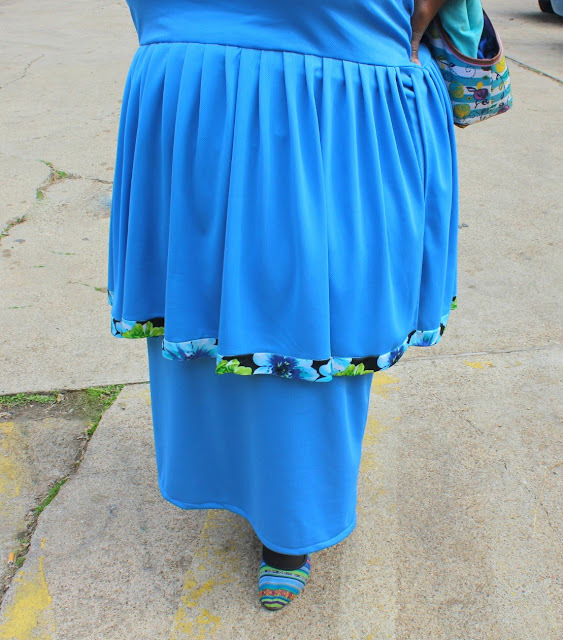 I asked her yesterday what is the story behind her dress and she told me it's an out and about dress. She goes grocery shopping in her casual dresses and to visit family and friends. 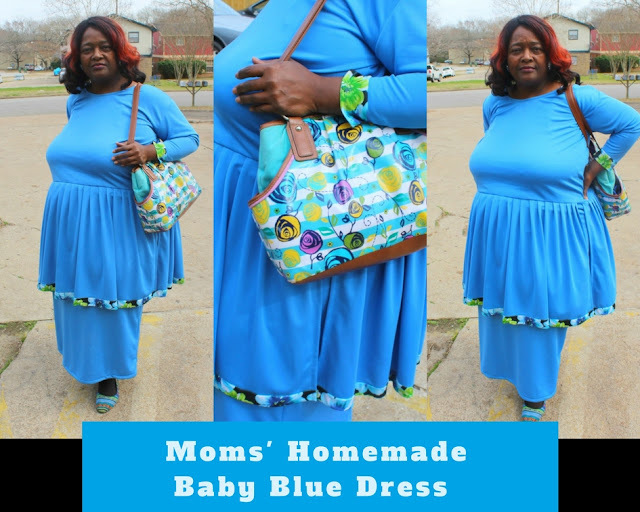 She chose a cute color to make this dress and she is very fashionable as you can see. She loves detail to things she makes. She trimmed her sleeves and the apron top with a pretty floral pattern. Also she added some cute tribal flats with different designs. I wished that I thought about taking a picture of her shoes lol! I was just excited to take a photo of this outfit, she wanted me to. Every hem is perfect. To you this may look like a blouse and skirt, but it's a dress. I don't know how she execute this lol! 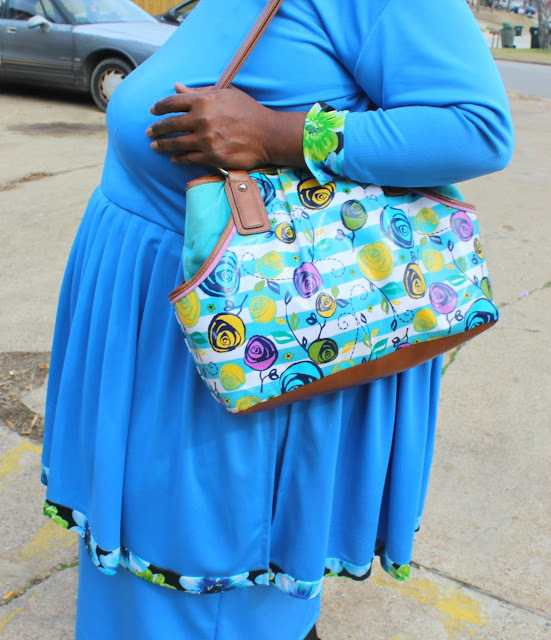 She added a cute tote bag with colorful flowers and I love how all the textures goes together. 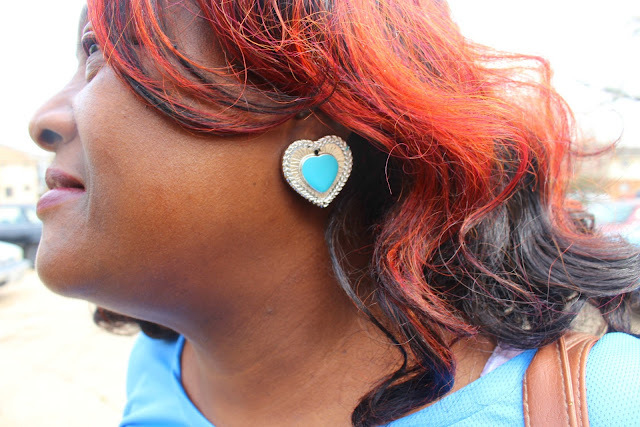 Every accessory had baby blue to bring this dress together, even the earrings.